The ghast is a flying hostile mob found in the Nether. The ghast spawns naturally in the Nether. It requires a 2x3 area of empty blocks above solid ground to spawn. The ghast can also be spawned using its spawn egg. 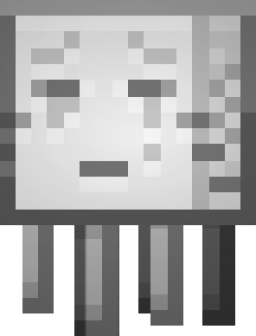 The ghast drops 0-2 gun powder, 0-1 ghast tear and experience points upon death. This makes the ghast tear and gunpowder renewable resources. The ghast floats around aimlessly until it catches sight of a player. When it sees the player it will open its mouth and shoot a fireball from its mouth. It will repeat this every so often, trying to follow the player. These fireballs are very powerful and can do a lot of damage to the player and surrounding blocks. However, the player can avoid being hit by hitting these fireballs, causing them to go back in the opposite direction. 43 Slay a ghast by its fireball Kill a ghast from the Nether by hitting its fireball back at it. A ghast in the Nether‎. This page was last edited on 14 December 2018, at 15:44.